I'm so excited to announce that I get to be a Sprint Ambassador for the next 10 months. I'm thrilled to participate in this program which will give me quite a few opportunities to test various Sprint devices and service options over the next year. What does this mean for you as one of my readers? You get the scoop on new products, plans and giveaways! Sprint has your family in mind with their Sprint Framily plan for you and up to 10 friends, family members, coworkers, parents for soccer team and more can be part of a Framily group with unlimited talk, text and 1 GB of data each while on the Sprint Network. Can you think of 10 people to be in your Framily group? A few of the cool things about this is that each member of the Framily plan will receive a separate bill, no annual service contract and no early termination fees for as little as $25 per month per line in the 7-10 Family group. Who is in your Framily? Does this sound like something that will save you and a family group some money? What family and friends or as Sprint likes to call it "Framily" would you team up with? There are a lot of people to consider, I know, but it is doable. I'm impressed that this can be done at $25 per line with unlimited text and talk and DATA! Even if this was used within the family it can save a lot of money vs. our current plan. How about yours? Right now for a limited time, new customers who bring their number to Sprint and sign up for the Sprint Framily Plan can receive up to $300 in credit for their current phone and a Visa® Prepaid Card worth up to $350 to cover switching fees. Say what? That is what I said when I read this! They are throwing this deal at you because they want your business. This offer is available exclusively at Sprint stores and online at Sprint.com through May 8th. You have a week left to get this done! To give you an incentive I get to giveaway a HTC One max smartphone to one of you! This phone has a massive screen of 5.9 inch display with amped speakers which is perfect for watching youtube videos and pictures on the go! It comes with a feature-rich camera to take fun, artistic phones and share on social media sites. This giveaway ends May 6th. So who is ready to enter to win? Do it today and stay tuned for more information about Sprint and their cool products & plans! I learned: You can have up to 10 friends, family, neighbors, employees, anyone on your family plan. I would have 3: Me, my husband and my MIL. I would have 4. Hubby,son and brother. 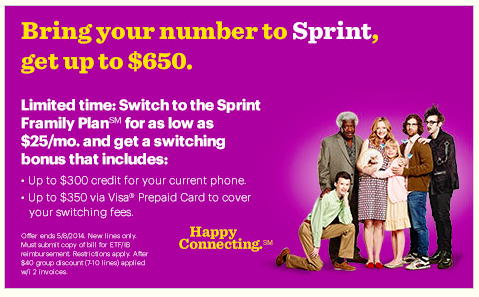 You can bring your number to Sprint and receive up to $650. Id have four. My mom, dad, brother and myself. I love the fact that there is no annual service contract. That is key! I learned there's no service contract. I would have myself, my husband, my father in law, and my mother in law on the plan. I would have my husband and friens and I learned that you can have up to ten friends, family anyone on your family plan! I would have 5 people in my Framily plan. I learned that you can maximize your savings by having more people in your plan. the more you add the cheaper it gets! I would have my parents and GF in my plan. I learned there is no annual service contracts. I learned that you can get Unlimited talk, text and 1GB of data each, while on the Sprint network. I would put my hubby, niece, sister, best friend, and cousin I my family plan. So including myself 6! I would add to Sprint Framily plan my mother and brother and best i like about Framily are huge savings. ONLY 2 ! :) our kids are toddlers and they dont need phones yet! i learned you can put as many people as you want on your plan! I would have 3 people in my Framly plan. I learned that it has unlimited talk, text and 1GB of data each, while on the Sprint network. Seven including me. I would have my husband, my mom, my dad, my grandma and my two older kids in my framily plan. We would have 4 in our Framiky. There would be 3 people in my plan: me, my daughter and husband. I love that there is no annual contract. there would be 6 people. I would have five people on my Framily plan. I learned that if I added 7-10 people to my Framily plan, each person would pay $25. the bigger the Framily, the bigger the savings, so the more people I have on my plan will give us all bigger savings...and the separate billings rock! I learned that you can have up to 10 people on your plan! wow!! I would put myself, my fiancee and 4 sisters on my framily plan! I would add 3 people to my plan. I would have myself and my two kids. I learned I can save about $40 a month over my current plan. There woul be 4 in my family plan. I learned that you can have up to 10 people in your framily plan. I would have my dad, 2 sisters and my girlfriend in my framily plan. I would have four, my two daughters, my huband and myself. I learned the plan includes unlimited talk, text and 1GB of data each, while on the Sprint network. It'd only me and my husband, our families live overseas, thank you. I would have 7 in my Framily. I learned everyone gets a separate bill. My mom and my husband. Thank you for this chance to win!!!!! Unlimited talk, text and 1GB of data each, while on the Sprint network! I would have my boyfriend, son, brother and best friend so there would be 5 of us total. I visited and learned there are no early termination fees!! I currently have 8 people in my Framily plan. I am interested in the no contract plan and the separate bills.